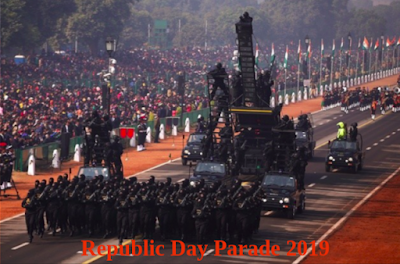 Happy Republic Day Parade 2019: The Republic Day is celebrated every year on January 26 to honor the date on which the Constitution of India came into effect in 1950. The celebration is held in grandeur in national capital's India Gate. This year marks the 70th Republic Day of India and like every year, the highlight of the day is the parade that takes place at the India Gate. And for the first time, a newly-formed all-woman bikers contingent of the Border Security Force (BSF) will make its debut on Rajpath on Republic Day. Happy Republic Day Parade is telecasted live on the public service broadcaster, Doordarshan. Going by media reports, US President Donald Trump has been invited by Prime Minister Narendra Modi to be the Chief Guest at the Republic Day Parade 2019. The news says that the invite is learnt to have been sent a few months back, which probably was formal follow up to what Modi had said at the White House in June 2017 standing alongside Trump, “I would like to invite you to India, along with your family. And I hope that you will give me the opportunity to welcome you and host you in India.” As per news, President Trump had accepted the invite then. Washington is yet to confirm Trump’s approval to be Chief Guest at Republic Day 2019 but in all probability it would be accepted. With an Indian Diaspora of some four million, US is our largest trading partner, and leading source for investments. Bulk of our IT exports are to the US, which is also preferred higher education destination for our youth – presently numbering around 2,00,000. Heads of State with whom India has diplomatic and economic relations are generally invited as Chief Guest for the Republic Day Parade. There is no set periodicity of inviting a head of state from particular country. However, it is significant to note that US President Obama was the Chief Guest for Republic Day Parade 2015, while Heads of State from Russia, Iran and Afghanistan were last invited as Chief Guests in 2007, 2003 and 1967 respectively. Interestingly, China’s head of state Marshal Ye Jianying was Chief Guest at Republic Day Parade 1958 while Pakistan’s Food and Agriculture Minister Rana Abdul Hamid was Chief Guest at Republic Parade 1965 – same year that Pakistan launched Operation ‘Gibraltar’ against India that culminated into the Indo-Pak War of 1965. Last year India hosted heads of state of all 10 ASEAN nations as Chief Guests at Republic Day Parade 2017. Much has happened with relation to the India-US relationship over past few months. The Indo-US 2+2 Dialogue has been postponed for the second time recently without citing reasons, while Nikki Haley, US Ambassador to UN was visiting India. Under President Trump, US has pulled out from the Trans-Pacific Partnership (TPP), Paris Accord, Iran Nuclear Deal, UN Human Rights, imposed sanctions on Russia and Iran, launched trade war with China, not sparing its allies, as also India – resulting in these countries imposing tariffs on US goods. Proposed US cuts in H-1B professional visas and cancellation of H4 spouse visas have also increased tensions. Trump plans to impose sanctions on Tehran’s energy sector, making imports of Iranian oil difficult due to fear of sanctions from the US. US warned India and China to cut oil imports from Iran and no waivers of any sort will be given. This hurts India, being the second largest importer of Iranian crude. However, a US delegation held in India held talks on the issue on July 17, 2018. However, recently US Treasury Secretary Steven Mnuchin has said US “may consider” providing waivers from the sanctions to some countries. Sanctions on Iran have left European nations also fuming. These sanctions also affect India’s Chabahar project. US also wants countries to cut down on defence deals with Russia. US officials say India’s proposed import of five S-400 Triumf systems ex Russia could be considered major purchase, attracting sanctions under Countering America’s Adversaries through Sanctions Act (CAATSA). However, India has already said that it is going ahead with the Triumf deal. The recent Trump-Putin summit in Helinsiki should soften the US stance on CAATSA even as lobbies on Capitol Hill do not want US-Russia détente. Same goes for NATO whom Trump has almost shown redundant despite the Saudi-led Islamic Military Counter Terrorism Coalition (IMTC) of 42 countries. Given Businessman Trump’s trade focus, easing of sanctions would obviously be linked to trade and defence deals. The US Senate passed a $716 billion bill on June 19, 2018 seeking enhanced defence ties with India, consequent to US recognizing India as a ‘major defence partner’ in 2016, which allows India to buy more advanced and sensitive technologies. On June 12, US State Department also cleared sale of six additional AH-64E Apache Attack Helicopters to India costing $930 million, subject to Senate approval. The first tri-service joint Indo-US exercise is scheduled later this year and the Indo-US 2+2 Dialogue is likely to be slated in September this year. There is concern world over about the unpredictability of Donald Trump which in turn relates to reliability of the US. Trump’s outbursts at Canada, EU, NATO are all characteristics, even calling EU ‘foe’. In fact, Vanity Fair termed Trump’s three-nation European trip as a “blunt-force attack”. It may be routine for haggling business deals but is certainly destabilizing at diplomatic levels. Also, this may be waived of as Trump’s idiosyncrasies, but pulling out of agreements for whatever reasons does raise questions about future intentions, as also if he does not get a second presidential term, will his successor annul all policies of Trump; in the manner Trump has dealt with Obama’s? Besides, the blow hot-blow cold dealing with Pyongyang has eventually almost nixed possibility of complete de-nuclearization of the Korean Peninsula. Our media is full of divided opinions on success or failure of Modi’s foreign policy, with both sides are raising the heat due forthcoming elections. Some even suggest comprehensive defence pact with the US in face of the increasing China-Pakistan nexus and developments in the Indo-Pacific, which is for the pundits in South Block to decide. Nikki Haley, during her India visit stated that Indo-US relations were never so strong. But while India upgrades its strategic bonds with the US, it would do well to secure the following, amongst other issues: first, our defence deals with Russia should not be subject to CAATSA, whether Triumf or any other – defence deals with US should be used as lever for such blanket waiver; second, while we are already importing oil from US, our oil imports from Iran should not come under sanctions, and; third, our Chabahar project should progress unhindered. These issues need to be sorted out earliest, including during the Indo-US 2+2 Dialogue, without waiting for Trump’s arrival in January next. It is also obvious that Modi has invited Trump as Chief Gust for Republic Day 2019 looking at the impact his presence would have on the general elections later next year – May 2019 or whatever. But in aiming so, Modi maybe taking a calculated risk, since odd inadvertent remarks by Trump related to religious intolerance, dealing with minorities, communal violence, lynching and the like could have adverse impact as well. Prime Minister Narendra Modi on Saturday, December 1 met South African President Cyril Ramaphosa on the sidelines of the G-20 summit in Buenos Aires and invited him to be the Chief Guest at the Republic Day celebrations 2019, which also marks the 150th birth anniversary of Mahatma Gandhi. The South African leader accepted the invitation to grace the occasion. “Glad to have met President @CyrilRamaphosa. At a time when India is marking the 150th birth anniversary of Mahatma Gandhi, it is our honour to welcome President Ramaphosa as the Chief Guest for the 2019 Republic Day celebrations. Bapu’s close link with South Africa is well known,” Modi tweeted after the meeting. He said Ramaphosa’s visit to India will further cement bilateral ties between the two countries. “The upcoming visit of President @CyrilRamaphosa, and that too during the special occasion of India’s Republic Day will further cement business and people-to-people ties between India and South Africa,” Modi tweeted. He was referring to July 18, 2018, which marks 100 years since the birth of the global icon Nelson Mandela, also popularly known as Madiba, who died in 2013 at the age of 95.